My annual trip to Santa Barbara was more jam-packed than usual. The number of producers making compelling wines continues to grow, which is great news for the consumer. Most of the wines I tasted were from 2014, a year in which Chardonnay seems to have done particularly well. I continue to believe Santa Barbara is one of California’s best-kept secrets. The region’s rich viticultural and winemaking culture offers much to discover. One of the questions I am most often asked is what attracts me most to Santa Barbara County. As I have written here before, the reasons are many. Santa Barbara’s rich historical fabric, multi-cultural melting pot of ethnicities and diversity of terroirs, microclimates and styles of wine open so many paths for the curious wine lover to explore. For more on those topics, as well as an in-depth look at the various regions, or AVAs, within Santa Barbara County, I refer readers to last year’s article. As of that writing, the Los Olivos District has been approved as an AVA, while the boundaries of the Sta. 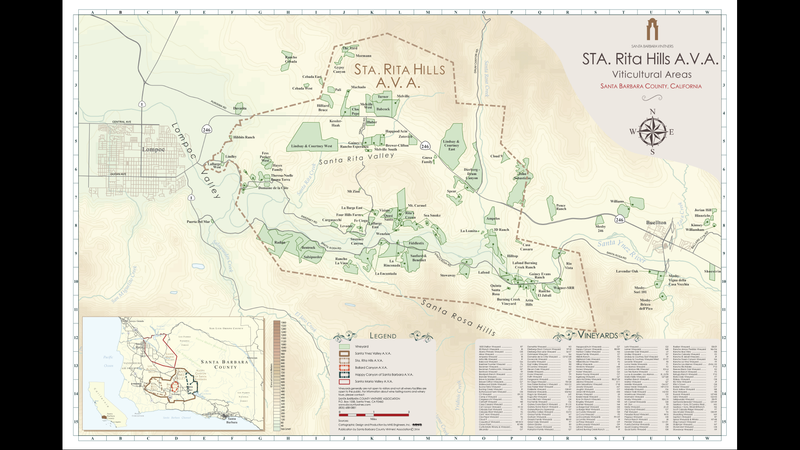 Rita Hills AVA have recently been expanded. On a personal level, I find Santa Barbara an incredibly fascinating region to spend time in. Although much was made of the expansion of the Sta. Rita Hills AVA, it is, in my view, a non-story. The Sta. Rita Hills has done a tremendous job of marketing itself as a cool-climate AVA. But do the wines really taste like cool-climate wines? By that, I mean are the wines vibrant, tense and energetic, as most consumers would expect in cooler climates? The answer, at least in my mind, is No. There are many reasons for this, including clonal selection, a preference for de-leafing and picking at higher sugars, all of which mitigate the cooling influences of the nearby Pacific Ocean. In addition, the appellation itself is quite varied. A brief look at the map below shows at least four separate micro-regions. 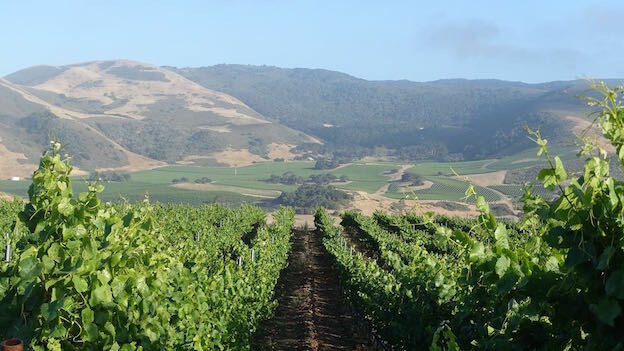 The first, the vineyards along Highway 246, is centered around Zotovich, Babcock, Melville and Clos Pepe, where many sites are rich in sand and yield delicate, often lifted wines. The hillside vineyards that form the Mt. Carmel/Rita’s Crown/Sea Smoke district often produce much more phenolic, intense, tannic wines except in some cases where the natural personality of the sites is dominated by different stylistic choices. Looking down from Mt. 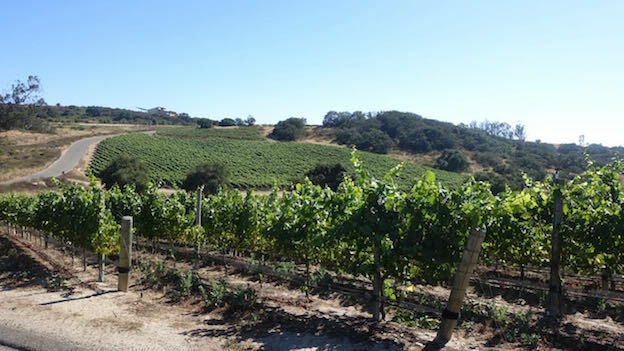 Carmel towards Sanford & Benedict reveals yet another cluster of vineyards – sites that tend to produce ripe, supple wines. Lastly, the vineyards towards the far west of the appellation, including Rancho Salsipuedes (and its vineyards Puerta del Mar, Bentrock and Radian) and La Côte, are cold, truly marginal sites. Even in the peak of summer, on a cloudy day the temperatures can be shocking cold. And that is just a cursory overview, as there are plenty of vineyards, some of them of exceptional pedigree, that fall outside of these clusters. For appellations to truly make sense, the wines from a place have to have some thing or things in common. I don’t really see that in the Sta. 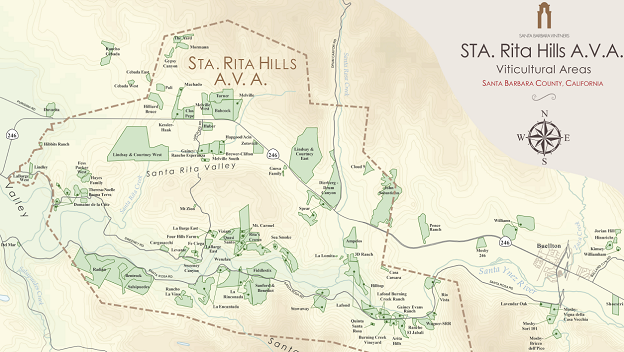 Rita Hills, which is why expanding the AVA does not strike me as particularly meaningful or important. What I would like to see is more discussion of the various districts within the Sta. Rita Hills and their unique attributes. The growing season got off to a record start because of an unusually warm, dry winter. Budbreak was as much as a month ahead of schedule. Weather during set was warm and dry, which resulted in the vines setting a healthy and abundant crop, much to the surprise of growers, especially given that 2014 was the third year in a drought cycle. 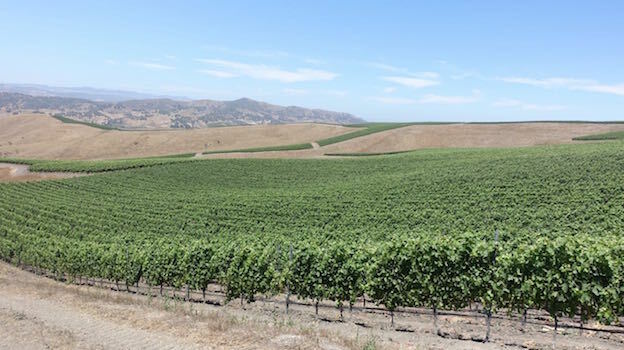 Warm, dry weather continued throughout the summer, with no real shocks to speak of, except for a few days of elevated temperatures that coincided with the Pinot harvest at some estates. Temperatures moderated in mid-August and into September, which slowed down the final phase of ripening. I did speak with a few growers who mentioned that the vines looked positively exhausted in the days leading up to the harvest. That is hardly surprising considering the stress that had accumulated over the last three years. The harvest got off to a record early start, but because the year also started very early, the overall length of the growing season was only about a week shorter than normal. That still means that the last days of ripening took place under the longer, hotter days of August rather than the more moderate, gentler days of September, but is clearly preferable to a year with a highly condensed growing season. In response to a third year of a healthy crop, many growers did pretty intense green harvests. That may not have been enough. According to a number of producers I spoke with, the Pinot clusters looked fairly normal in size, but when they came off the vine, the grapes had much more juice than what most people expected. As a result the juice to skin ratios were high, which is the inverse of what is considered ideal for the production of high quality wines. Producers were surprised, perhaps even shocked, by the high yields of 2014, given that both 2012 and 2013 were drought years in which yields were also abundant. Sta. Rita Hills recorded its highest yields ever. Pinot Noir appears to have been the most affected variety in 2014. Taken as a group, the 2014 Pinots are translucent, slightly compact wines. The very best 2014s are delicate, nuanced and, in some cases, extraordinarily beautiful. But where yields were too high, the 2014s lack mid-palate stuffing, depth and density. I tasted many 2014 Pinots that showed elements of dilution, washed out flavors and advanced flavor profiles. A number of growers told me the 2014 Pinots lacked color intensity right at crush. Given how so many wines taste that is hardly a surprise. The definition of site – something that lies at the heart of what gives meaning to vineyard-designate bottlings – is also not always present or as precise as it is in the best vintages. 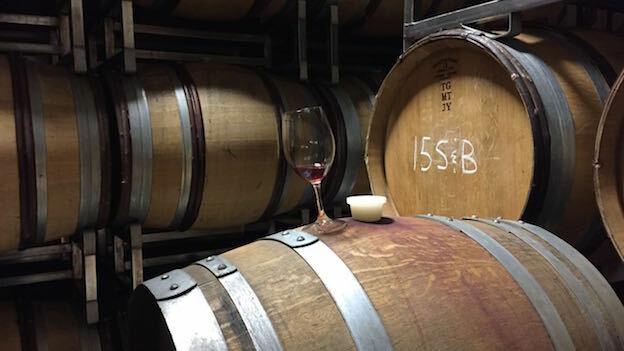 Most 2014s Pinots give the impression they are best suited to near and medium term drinking. One of the challenges of 2014 is that the harvest was condensed into a fairly narrow window of just a few weeks. Because such a large part of the industry depends on contracted workers to perform essential tasks such as picking, and because so much wine is made in shared facilities, not every producer was able to make optimal choices. Lack of total control is seldom given much importance when discussing the quality of vintages and wines, but it can be a critical factor. If a producer is sharing tanks with a group of other producers and there is no tank space available at the optimal time to harvest, what do you think happens to those grapes? They sit out on the vine until they can be picked and brought into the winery. For small, artisan wineries and labels, these kinds of compromises are a hard fact of life. Chardonnay, on the other hand, is much more forgiving with regards to higher yields. Although the 2014 Chardonnays can at times suffer from the same ills as the Pinots, namely dilution, they are on average much stronger across the board. Like the Pinots, the 2014 Chardonnays are mid-weight wines that are likely to offer their best drinking sooner rather than later, but readers will find no shortage of gorgeous wines in this vintage. Many producers release their Syrahs a year later than their Pinots and Chardonnays, so it is too soon to have a complete view of the vintage, but the early examples I have tasted suggest Syrah suffered from some of the same ills as Pinot. But Syrah naturally offers more depth and density than Pinot, and a number of examples I have tasted thus far are compelling, especially in Ballard Canyon. So far I have only tasted a small number of 2015s, but the wines I have tasted are nothing less than thrilling. After three years of being pushed to the limit by drought and high yields the vines responded by setting a tiny crop. Yields were down significantly. The result is deep, dense, textured wines loaded with richness that, at their best, have also somehow retained a good deal of freshness. At this stage, 2015 is highly promising for both whites and reds. The only issue is production, which is down sharply relative to previous years. For the first time ever, I ran across new sparkling wines at many properties I visited. I am not sure that sparkling wine is the best use of fruit from Santa Barbara’s very best vineyard sites, but it is early in the development of the genre, and while I think Santa Barbara sparklers are more a fad than something with serious long-term potential, I am willing to keep an open mind. What I am 100% sure of is that sending young wines in barrel to be completely finished at an outside, outsourced facility is not a way to make serious wine, much less serious sparkling wine. Proponents of this approach will say that sparkling wine requires considerable technical expertise and specialized equipment that a small boutique winery doesn’t have and can’t afford. This is unquestionably true. Making sparkling wine does require more technical knowledge than any other wine and is labor intensive, which is why many, if not most, Santa Barbara sparkling wines are bottled, disgorged and finished at outside facilities. 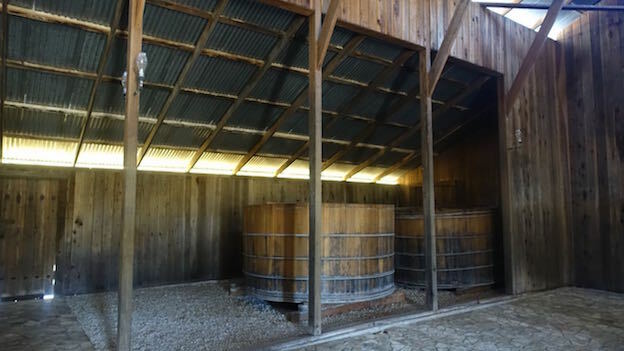 Outsourcing is fine for more commercially oriented wineries, but it is simply not good enough for the higher-end, more artisan wineries that Vinous readers are interested in. It’s that simple. Yes, there are exceptions and yes, there are also a few highly skilled professionals working at some of these specialized facilities who have a fabulous touch. They are the exceptions, not the rule. The only way to make truly distinctive and consistently outstanding wines is to do so in house from start to finish. The overwhelming majority of Santa Barbara sparklers are wines I can’t recommend, nor are they wines I would buy myself. At the same time, the best examples suggest there is considerable potential. Most Santa Barbara sparklers are made in tiny quantities. It will be interesting to see if the category truly takes off and becomes viable on a larger scale. I tasted the wines in this article during a visit to Santa Barbara in late June 2016, followed by additional tastings at my office in the days that followed. There are a few producers I have covered in the past that are missing from this report for a variety of reasons, including late arrival of samples and bottling times that were too close to my visit to allow for wines to show at their best. We will be publishing a small supplement to this article consisting of a few dozen wines at the end of the month.